BeritaDEKHO - KRI Bima Suci is clearly bigger than her predecessor (KRI Dewaruci) wirh an overall lenght of 111.20 meters, a beam of 13.65 meters, and a heighth of 49 meters counting from the ship's deck. The ship has 26 sails that reach a total surface of 3,352 sq meters while the main dock is at 9.2 meters over sea level. 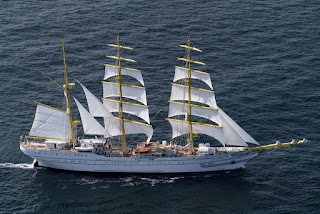 KRI Bima Suci is in effect a modern ship equipped with a series of extremely sofisticated navigation and commnication tools and with a reverse osmosis water supply.